High-definition televisions are the norm. Whether you are looking for 1080p or 4K, you have no shortage of choices when it comes to units that deliver high-quality content. This is especially true for television sets that are at least 50 inches. Manufacturers understand that the sets they bring to the market must deliver outstanding picture quality regardless of the setting or the content being viewed. Consumers shopping for these larger TVs, even entry-level ones, are often looking to get an amazing viewing experience and, as a result, expect their TV sets to deliver the best picture quality possible. If you’ve done any shopping for TVs, then you’ve undoubtedly come across a number of options from VIZIO, including several in the 50” range alone. To help you with your search, we’re providing you with a product review of the VIZIO M55-EO, one of the best overall TV sets on the market. Use this review as a guide as you narrow down your TV options. Product Overview: What Is the VIZIO M55-E0? The VIZIO M55-E0 is a 4K UHD LED smart TV that came out in 2017, and it’s one of the better units on the market for its price range. It offers better than average picture quality and does a great job of displaying high dynamic range (HDR) content with good color variety. Despite not offering some of the capabilities of higher-end models, the M55-E0 serves its purpose better than most in this price range by combining great picture quality with an excellent smart TV interface. Here are some of the key specifications that you should be aware of when it comes to the M55. The M55 has a clean, simple design, but it isn’t overly plain. In terms of build quality, the M55 is primarily made out of plastic with metal edges on the borders. Its borders are thicker than what usually accompanies a flat-screen TV, but not so thick that it’s unappealing. However, you should expect it to stick out a little bit when it’s mounted on a wall. The unit comes with two metal feet that are placed quite a distance apart, so if you’re not going to hang the TV up, be sure that the stand you use is wide enough to fit both feet. The M55-E0 delivers great picture quality. It offers relatively good brightness although it’s not as bright as higher-end TVs are. It also performs well in bright rooms, but you may have difficulty fighting off glare if the sun is pointing straight at the screen or you have a bright lamp nearby. With its high contrast ratio and black uniformity, the TV has deep blacks and great contrast, especially when watching in dark rooms. One noticeable negative to the M55 is that the picture quality decreases quite a bit when viewing at wider angles, so be sure to keep that in mind when inviting large crowds over to watch the game. You should also expect good motion handling from the M55-E0. Most gamers and sports enthusiasts should have no problem enjoying content, as the model offers an impressive response time for fast-moving objects. The M55-E0 can support almost any input signal. All the connections and controls, except for the power connection, are located on the left side of the back. It comes with one HDMI 2.0 port for 4K and HDR definition and three standard HDMI ports. The HDMI 2.0 port, which looks the same as an HDMI 1.0 port and accepts HDMI 1.0 cords, faces left along with two USB ports, a composite video input and five RCA connectors. An Ethernet port, three additional HDMI inputs and optical and stereo RCA audio outputs all face down at the bottom of the panel. Having only one HDMI 2.0 port leaves a bit to be desired since other competitors in this class now include three or more HDMI 2.0 ports for more 4K access. This TV also lacks a built-in tuner, so you will need an external tuner to use an antenna or play cable channels. The M55-E0 comes with two 15W speakers, but you’re going to need additional speakers or a sound bar because the native sound isn’t all that great. It’s decent for basic viewing, but not good enough to provide the surround sound experience that’s desired for gaming or watching movies. VIZIO has done a great job of enhancing its smart TV platform, SmartCast, so that it’s not simply a hyped-up Chromecast. The SmartCast app for phones and tablets allows for full control over the TV’s settings and lets those devices act as remotes. As with Chromecast, most content on smartphones and tablets can be cast directly to the TV using SmartCast. The downsides to the SmartCast platform are that only 10 apps are supported and there is no app store. While YouTube is noticeably absent from the list of apps, you can still use your phone or tablet to stream and cast YouTube and any Google content to your TV. You also have the option of plugging in your USB and accessing content directly from there. As previously stated, there are many other 55-inch TVs on the market. To keep our ratings as fair as possible, we’ve limited our comparisons to TVs within the same price range as the M55-E0. The 55-inch Sony X800E also came out in 2017 and is around the same price as the M55-E0 is. It’s a 4K LED smart TV that delivers good picture quality. It’s better than the M55 in that it offers a wide 178-degree viewing angle, so viewers can experience the same picture quality from just about anywhere in the room. It also comes with a built-in digital tuner, which is not included in the M55. The X800E has 4K HDR Processor X1, so it displays contrast extremely well. The TRILUMINOS display technology helps deliver vivid detail. But while blacks on the M55 are deep and crisp, on the X800E they’re not as deep and are a bit blotchy, which makes for a less-than-optimal viewing experience in dark settings. Like the M55, the X800E has a low input lag and does well with fast-moving action. It comes with two built-in Bass Reflex speakers, but, similar to the M55, the Sony delivers good but not great sound. The smart features are served on the Android TV 7.0 Nougat platform. This TV comes with built-in Chromecast and gives you access to the Google Store where you can download any number of additional apps. Google Assistant is built in, and it’s also compatible with Amazon’s Alexa. You can purchase the X800E for around $900, and it comes with a 12-month warranty on parts and labor. The TCL 55P607 also came out in 2017 and is slightly cheaper than the M55-E0. Similar to the M55, the 55P607 is a 55-inch 4K LED smart TV that delivers deep blacks and above-average quality pictures. It uses local dimming technology to enhance the contrast and comes with lots of HDR features such as Dolby Vision HDR, which allows for large color volume and high brightness. Unlike the X800E and like the M55, the 55P607’s image quality does not hold up very well at wide angles, and the picture uniformity is not ideal. It does handle fast-moving action without any lag or blur, which is on par with the M55. The 55P607 uses Roku TV as its smart platform. It’s not as involved of a platform as Android TV is, but its simplicity makes it fast and easy to navigate. The interface is extremely responsive and performs with very little lag. With the Roku app, you can use your smartphone or tablet as a remote to launch apps and change inputs and settings. The 55P607 allows for mobile-to-TV-screen mirroring, and, except for the HDMI input, you can play the TV’s audio through your phone and tablet. You can purchase the TCL 55P607 for around $500, and it comes with a 12-month parts and labor warranty. Introduced in 2017, the 55-inch MU6300 is Samsung’s entry-level option for this class. It’s a 4K LED smart TV that offers good picture quality and features, and it’s slightly costlier than the M55-E0. Similar to the M55, the image quality decreases drastically at wide viewing angles. While the MU6300 does have the ability to support HDR content, its capabilities in that sense are limited. So, unlike the M55, it doesn’t come with local dimming technology or a wide range of color. It does come with 4K color drive technology, which allows it to deliver vibrant and lifelike colors, and it is better than the M55 is at upscaling lower-resolution content. Gamers and other individuals who consume fast-moving content will love the MU6300’s low input lag and its ability to play such content with great clarity. It also comes with a built-in tuner, which the M55 does not have. The MU6300 uses Samsung’s Tizen as its smart platform. It’s easy to navigate, with most features being accessible from the home menu. The remote comes with a microphone that allows you to search for content and control the TV’s settings without having to navigate to the television's interface. There is screen mirroring from the TV to your smartphone and tablet and vice versa. A full web browser is also available, so you can shop and do other online browsing without switching devices. You can purchase the MU6300 for around $800, and it comes with a 12-month warranty on parts and labor. The M55-E0 offers several positive qualities, but it’s also lacking in certain areas. Here is some of what you can expect to like and dislike about this unit. Image quality – The M55-E0 offers better image quality compared to other 55-inch TVs in this price range and even compared to more expensive ones. Handles HDR10 and Dolby Vision formats: The highest-quality content can be viewed as intended on the M55-E0. Controllable with Google Home speaker: Users can control their TV without the remote. Low input lag: It does a great job of handling fast-moving gaming and sports content. Lacking brightness: The unit offers decent brightness, but it's not as bright as high-priced options are. No built-in tuner: Users who want to hook up an antenna directly to their TV should look to alternatives or purchase an external tuner. Poor quality at wider angles: The quality of the image decreases as the viewing angle gets wider, so watching games with a large number of people can be problematic, especially for those sitting off center. Poor with reflections: Bright lights can cause a glare, so users in sunny rooms may have difficulty seeing what’s on the screen. The M55-E0 delivers a very strong performance and excellent features at an affordable price. It’s a nice step up for individuals looking for a bigger TV screen priced between the premium and the entry-level sets. It’s a good 4K UHD LED TV that offers excellent pictures in dark settings and produces deep and uniform blacks. Gamers and sports fans will love it as it is great at handling fast-moving content. It’s not the ideal TV for bright, large rooms due to its limited viewing angles and poor handling of reflections. Even with these limitations, we recommend the M55-E0 as the best option in its class and price range. 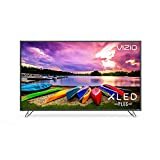 We give this featured product VIZIO M55-E0 a 4 out of 4 stars. The M55-E0 is the best option in its class and price range. It’s not the ideal TV for bright, large rooms due to its limited viewing angles and poor handling of reflections. Even with these limitations, it can deliver a very strong performance. We confidently give it a 4-star rating!